Ronnie Peterson took his third victory of the season at Monza to keep alive his slim hopes in what was fast becoming one of the closest championships in recent history. There was much interest in the Italian Grand Prix as a tight championship battle was coupled with a distinct possibility of a Ferrari victory in front of the Tifosi, and Niki Lauda didn't disappoint the masses on Saturday as he took pole position. Carlos Reutemann lined up alongside him and headed a trio of Brabhams as Carlos Pace was third and John Watson fourth; Watson using a works car having crashed his during practice. Clay Regazzoni put the other Ferrari on row three ahead of Emerson Fittipaldi and Peterson's Lotus. At the start the order remained unchanged, with Regazzoni the first to make a move as he passed Watson for fourth on lap two. Showing the sort of pace Lauda had displayed during practice, Regazzoni then dispatched Pace and Reutemann to make it a Ferrari one-two. The challengers soon began to fade, notably the Brabhams as Reutemann retired with gearbox trouble and tyre issues slowed Pace. With Watson having gone off, Peterson was up to third, and then on lap 30 disaster struck for the Tifosi. Lauda's car started emitting smoke, and a few laps after Regazzoni took the lead, Lauda's engine expired. Ten laps later and the exact same thing happened to Regazzoni, leaving both Ferrari's out of the race and Peterson at the head of the field. 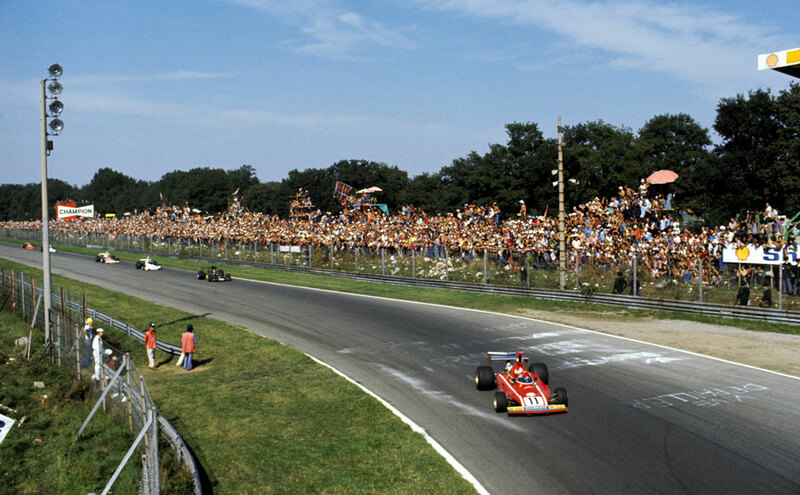 Fittipaldi suddenly sensed a victory to boost his title chances with Regazzoni out and Scheckter behind, and applied constant pressure to the lead Lotus. Peterson was faultless though and managed to resist the attentions of Fittipaldi to win by just 0.8s. Scheckter came home a distant third, and Arturo Merzario was the highest-placed Italian in fourth spot as the chasing Pace in fifth had already been lapped. Denny Hulme rounded out the points with sixth place. The result left the title battle even closer with two rounds to go. Regazzoni (46) had seen his lead slashed and he now headed Scheckter by just one point, with Fittipaldi two points further back on 43. Lauda was still in with a chance on 38 points, while Peterson retained a very slender hope with 31.